Grady Clay has spent a lifetime trying to understand America's natural and man-made environments, their history, their design and their visual landscapes. With these carefully-selected excerpts from his long-running and popular public radio essay series, Clay scratches down into the surface of his investigations, discussing such unique concepts as "Arrival Zones," "Haunts," "Meeting Places," "Walking Distances," "The Boondocks" and the "Twilight Zone", and exploring the meanings of terms like "Disorder," "The Dark," "Out Back," "Uptown" and in "Earshot". Longtime fans will recognize old favorites from Clay's repertoire, and newcomers will delight in discovering his language-centric approach to contemplating this curious and fascinating world in which we live. Grady Clay is the former Urban Affairs Editor of the Louisville Courier-Journal and for 23 years the editor of the magazine Landscape Architecture. 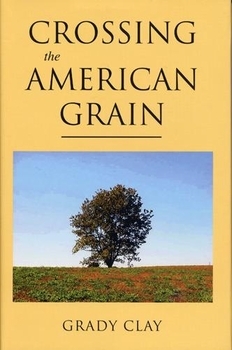 His commentary “Crossing the American Grain” aired weekly since 1991 on Louisville’s public radio station, WFPL. He is the author of Alleys: A Hidden Resource, Real Places: An Unconventional Guide to America’s Generic Landscape and a monograph on urban design competitions, which led to serving on many juries, including, as its chair, the jury which chose the design of the Vietnam Veterans Memorial in Washington, D.C.